محمدی, علی, محب الحجه, علیرضا, مزرعه فراهانی, مجید. (1397). چندجمله‌ای درون‌یاب هرمیت درجه سوم یکنوا و کاربرد آن در تبدیل مختصات برای مدل‌های پیش‌بینی عددی وضع هوا. مجله ژئوفیزیک ایران, 12(3), 21-38. علی محمدی; علیرضا محب الحجه; مجید مزرعه فراهانی. "چندجمله‌ای درون‌یاب هرمیت درجه سوم یکنوا و کاربرد آن در تبدیل مختصات برای مدل‌های پیش‌بینی عددی وضع هوا". 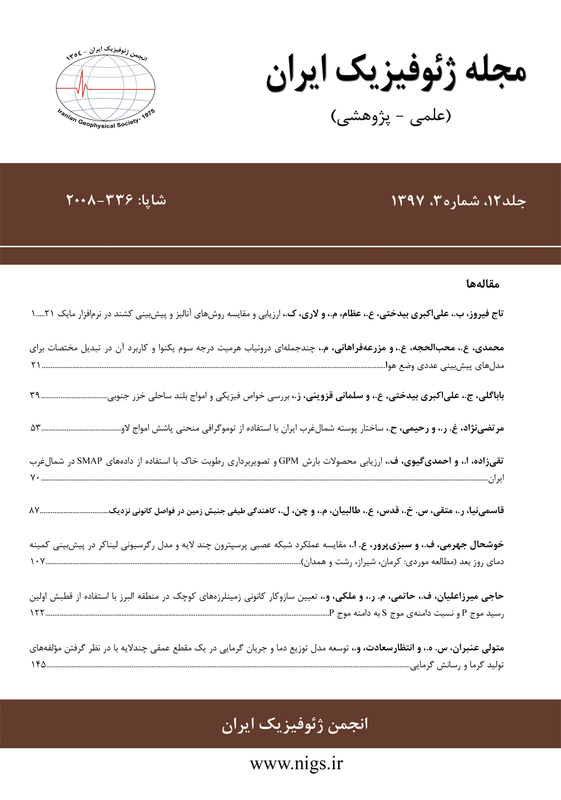 مجله ژئوفیزیک ایران, 12, 3, 1397, 21-38. محمدی, علی, محب الحجه, علیرضا, مزرعه فراهانی, مجید. (1397). 'چندجمله‌ای درون‌یاب هرمیت درجه سوم یکنوا و کاربرد آن در تبدیل مختصات برای مدل‌های پیش‌بینی عددی وضع هوا', مجله ژئوفیزیک ایران, 12(3), pp. 21-38. محمدی, علی, محب الحجه, علیرضا, مزرعه فراهانی, مجید. چندجمله‌ای درون‌یاب هرمیت درجه سوم یکنوا و کاربرد آن در تبدیل مختصات برای مدل‌های پیش‌بینی عددی وضع هوا. مجله ژئوفیزیک ایران, 1397; 12(3): 21-38. درون‌یابی یکی از ابزارهای ضروری برای پژوهش­های هواشناسی است. کاربرد روش‏های درون‌یابی در پیش‏بینی عددی پررنگ‏تر است به‌گونه‌ای که از ارکان اصلی حل معادلات با روش­های لاگرانژی و نیمه‏لاگرانژی است. یکی از مشکلات عمده در اختصاص یک چندجمله‏ای به تابع مورد نظر برای درون‌یابی، نایکنوایی است. معمولاً در یک چندجمله‏ای، هنگام درون‌یابی در بازه بین دو نقطه، بیشینه و کمینه نسبی ایجاد می‏شود، مگر آنکه تابع یکنوا باشد. تولید بیشینه و کمینه نسبی در این بازه، سبب می‏شود که مقدار درون‌یابی شده در خارج از بازه داده‏ها قرار گیرد که این عامل، باعث بروز خطای فاحش در محاسبات عددی می‏شود. به‌همین‌دلیل، پژوهشگران تلاش‏های زیادی را برای حذف بیشینه و کمینه‏های نسبی در بازه‏های مورد درون‌یابی کرده­اند که عمده آنها برای چندجمله‏ای هرمیت درجه سوم انجام شده ‌است. یکنوا کردن تابع درون‌یابی، با استفاده از تغییر مشتق در نقاط اصلی صورت می‏گیرد. با تغییر مشتق، مقدار خطای درون‌یابی نیز تغییر می­کند؛ بنابراین ایده اصلی برای کم کردن خطا این است که برای نیل به یکنوایی، مشتق کمترین تغییر ممکن را داشته باشد. در این پژوهش، از چندجمله‏ای درجه سوم هرمیت برای درون‌یابی یکنوا استفاده می­شود و با اعمال کمترین تغییرات روی مشتق، میزان خطای یکنواسازی به حداقل ممکن کاهش می­یابد. سپس نتایج با سایر روش‏های درون‌یابی یکنوا مقایسه می­شود. بهبود عملکرد با حفظ خمیدگی در بازه مورد درون‌یابی، از نتایج این پژوهش است. Interpolation is one of the essential tools for meteorological research. The most important meteorological application of interpolation is in semi-Lagrangian methods. In semi-Lagrangian methods, the departure points of the particles arriving at the regular grid are calculated and the scalar quantity is interpolated at the departure points. A common problem is the creation of spurious fluctuations in interpolation values in areas with strong gradients if polynomial interpolation of higher than first degree is used. In order to remove spurious fluctuation, it is necessary to use monotone interpolation. The concept of monotone interpolation requires that the value of the interpolation of the function at the interval between two neighboring grid points should not be greater or less than the maximum and minimum of the function at that interval, respectively. That is, no relative extrema should be produced in the interval. The most famous method for monotone interpolation results from changing the derivatives used in cubic Hermit polynomial with respect to the slop of the function within the interpolation interval. By changing the derivatives, one can adjust the curvature of the interpolator between the beginning and the end of the interpolated interval. The main idea of the change in derivatives is that the derivatives in each interval should not exceed by roughly three times the slop of the function on that interval. In this paper, the curvature of the cubic Hermit polynomial is adjusted between the maximum value still giving monotonicity and the minimum value, corresponding to linear interpolation between the two points. The Hermit functions need derivatives of the function on the grid points for interpolation. For this reason, the cubic Hermit was chosen for implementation of the monotonicity procedure. The monotone piecewise cubic interpolants are easy to use, of sufficient accuracy and have been widely used. This interpolation is of second order accuracy near strict local extrema due to the application of the monotonicity constraint. It is generally the case that most monotonicity-preserving methods sacrifice accuracy in order to obtain monotonicity. Numerical experiments with this method show that the maximum curvature still giving monotonicity may bring the cubic Hermit function close to the relative maximum and minimum in the interval. The (weakly monotone) interpolant with minimum curvature between the two neighboring points may decrease the accuracy of the interpolation as the curve connecting the two points tends to a line. The best choice for curvature in terms of both accuracy and monotonicity is intermediate between the discussed maximum and minimum values. For an important example of practical application in meteorology, the presented method is used in transforming meteorological data in horizontal and vertical directions. An error analysis suggests that interpolation in the vertical direction for transferring data from pressure to the hybrid σ - θ, exhibits a large sensitivity to the amount of curvature used in the implementation. Maintaining maximum curvature in the interpolation function reduces the distance between vertical surfaces such that the crossing of vertical surfaces will result in error. Beatson, R. K., and Wolkowicz, H., 1989, Post-processing piecewise cubics for monotonicity: SIAM Journal on Numerical Analysis, 26, 480–502. Costantini, P., 1987, Co-monotone interpolating splines of arbitrary degree — a local approach: SIAM Journal on Scientific and Statistical Computing, 8, 1026–1034. Costantini, P., 1988, An algorithm for computing shape-preserving interpolating splines of arbitrary degree: Journal of Computational and Applied mathematics, 22, 89–136. Du Preez, P. F., and Maré, E., 2013, Interpolating yield curve data in a manner that ensures positive and continuous forward curves: South African Journal of Economic and Management Sciences, 16, 395–406. Fritsch, F., and Butland, J., 1984, A method for constructing local monotone piecewise cubic interpolants: SIAM Journal on Scientific and Statistical Computing, 5, 300–304. Fritsch, F. N., and Carlson, R. E., 1980, Monotone piecewise cubic interpolation: SIAM Journal on Numerical Analysis, 17, 238–246. Huynh, T., 1993, Accurate monotone cubic interpolation: SIAM Journal on Numerical Analysis, 30, 57–100. Hyman, J. M., 1983, Accurate monotonicity preserving cubic interpolation: SIAM Journal on Scientific and Statistical Computing, 4, 645–654. Ibraheem, F., Hussain, M., Hussain, M. Z., and Bhatti, A. A., 2012, Positive data visualization using trigonometric function: Journal of Applied Mathematics, 1–19, doi: 10.1155/2012/247120. Jablonowski, C., and Williamson, D. L., 2006, A baroclinic wave test case for dynamical cores of general circulation models: Model intercomparisons: NCAR Technical Note NCAR/TN-469+STR. Karim, S. A. A., and Kong, V. P., 2014, Monotonicity-preserving using rational cubic spline interpolation: Research Journal of Applied Sciences, 9, 214–223. Karim, S. A. A., and Voon Pang, K., 2016, Shape preserving interpolation using C2 rational cubic spline: Journal of Applied Mathematics, 3,1–14, doi: 10.1155/2016/4875358. Konor, C.S., and Arakawa, A., 1997, Design of an atmospheric model based on a generalized vertical coordinate: Monthly Weather Review, 125, 1649–1673. Mohebalhojeh, A. R., and Dritschel, D. G., 2007, Assessing the numerical accuracy of complex spherical shallow water flows: Monthly Weather Review, 135, 3876–3894. Mohebalhojeh, A. R., Joghataei, M., and Dritschel, D. G., 2016, Towards a PV-based algorithm for the dynamical core of hydrostatic global models: Monthly Weather Review, 144, 2481–2502. Pruess, S., 1993, Shape preserving C2 cubic spline interpolation: IMA Journal of Numerical Analysis, 13, 493–507. Sarfraz, M., Hussain, M. Z., Shaikh, T. S., and Iqbal, R., 2011, Data visualization using shape preserving C2 rational spline: Information Visualisation,4, 528–533. Wolberg, G., and Alfy, I., 1999, Monotonic cubic spline interpolation: Proceedings of Computer Graphic International, 1999, pp. 188–195. Wolberg, G., and Alfy, I., 2002, An energy-minimization framework for monotonic cubic spline interpolation: Journal of Computational and Applied Mathematics, 143, 145–188.